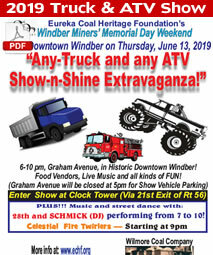 The Miners' Day Festival is sponsored by the Eureka Coal Heritage Foundation with assistance from WAVE (Windber Area Visioning Experience), the Windber Museum volunteers and the Windber Hotel staff. 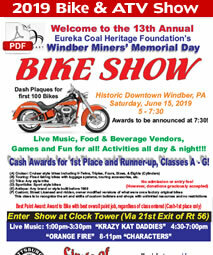 It is an annual event to honor the coal miners who worked and died in the mines, growing from a small parade on main street to the current 4-day street festival. 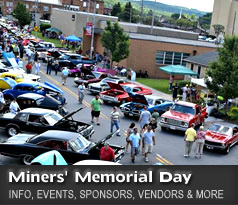 Visitors from around Southwestern Pa. and beyond come to enjoy events including car, motorcycle, and truck/ATV shows with live entertainment; street dances each night featuring area bands; fireworks; food and craft vendors; children’s petting zoo and games; parade and other fun family activities. 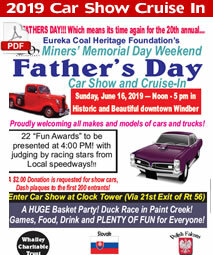 This event is designed to celebrate our rich heritage in coal and family values. Good, clean entertainment for the entire family! Of course, none of this can be accomplished without the generous support of our sponsors. 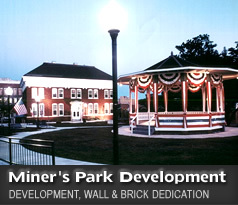 We invite you to visit and support the many sponsors from our Festival Sponsors' list. Without their support this event would not be possible. THANK YOU! 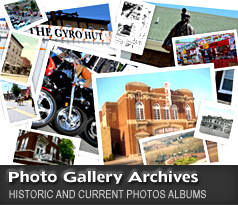 *Click the images below to view the full-size documents in Adobe PDF Reader. To become a craft vendor, download the Craft Vendor Form here. To become a food vendor, download the Food Vendor Form here. Mike and Kayla Meck, Jr.